Zara Shahjahan Lawn 2017 launch was one of the most highly anticipated event. The wait was over and the collection was finally out on 15th March, 2017 which is now available at Dress Republic Online Store with same high quality tailoring and stitch services. 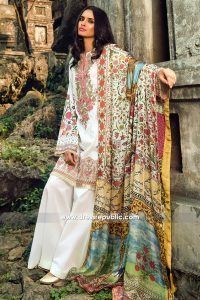 For Spring / Summer 2017, all lawn designers have worked really hard, You can expect from Zara Shahjahan Lawn 2017 quite surprising and amazing prints. In fact, the collection is full of newness and freshness marking to continue the WOW factor promise. Dress Republic provides you with an opportunity to get your lawn order tailored in a way that is truly one of a kind. Choose from over 1,000 latest Lawn and Chiffon suits of major Pakistani designers and we will specially hand-stitch your clothes that are perfectly fit and styled. For more information please contact Dress Republic or WhatsApp us for quick questions at +1 424 248-5789.